Whether you’re a contractor or a tradesman, building your own business requires a solid online presence to share your projects and start dominating local search engine results to bring in more work. Using construction WordPress themes might be just what you need to give your brand a leg up on the competition. The themes included here allow for a direct connection with your clients and workers, showcasing the types of projects you work on and revealing some of the high-resolution photos that exemplify your top work. 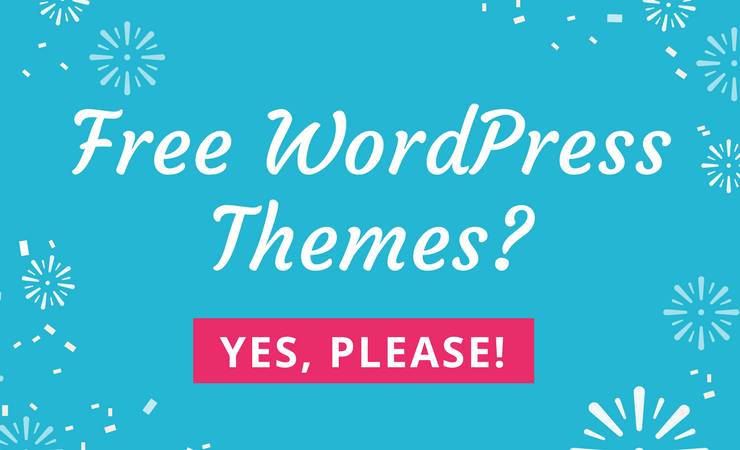 Not to mention, these WordPress themes provide a professional way for people to contact you or to read what you’ve posted on a blog. What Makes a Quality Construction Theme? When choosing your construction theme, be on the lookout for a theme that allows you to build custom image galleries or has a portfolio option. If it doesn’t allow for this, make sure it integrates with any of the popular portfolio or gallery plugins. For local companies or contractors, Google Map integration is essential, as is a working contact or “hire me” form. Since contractors and tradesmen can get busy rather quickly, look for a theme that is easy to setup and allows for plenty of customization options without a lot of hassle. Why Use a Theme in the First Place? An attractive construction theme is sure to bring attention to your services, regardless of what area of the construction industry you belong to. These themes can be adapted well. For instance, one could be used on an architect’s website just as easily as it could be displayed on a larger construction company’s site. If you’re working solo as a construction freelancer or handyman, these themes will serve you well, too. Not to mention, they’ll allow you to present your services in a professional manner. Let’s take some time now to look at the best themes for construction professionals. 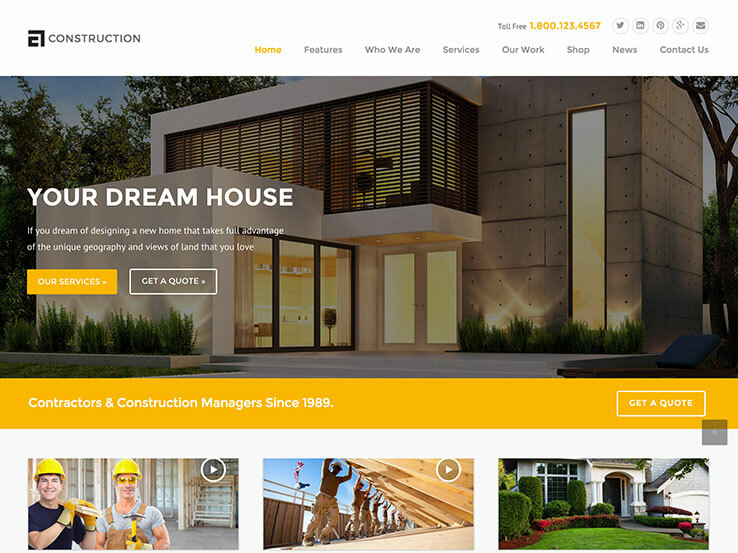 Designed for building and construction companies, the Construction Pro theme brings a professional and elegant design along with a set of handy features to grow your business online. It includes a contact form in the header on the main page so people can easily request a quote, as well as a projects section to highlight your previous works. You’ll also find a testimonials section to display client feedback and boost your sales, and a team section to show off your best employees. You won’t have to create most of your pages from scratch since the Construction Pro theme includes several important page templates – about us, contact us, services, team members, testimonials and portfolio. Besides, the template offers lots of customization options, including unlimited color schemes, hundreds of fonts, unlimited background options and custom widgets. Along with social media integration, Google maps, translation tools and eCommerce support, the Construction Pro theme is a solid choice for all constitution-related businesses. 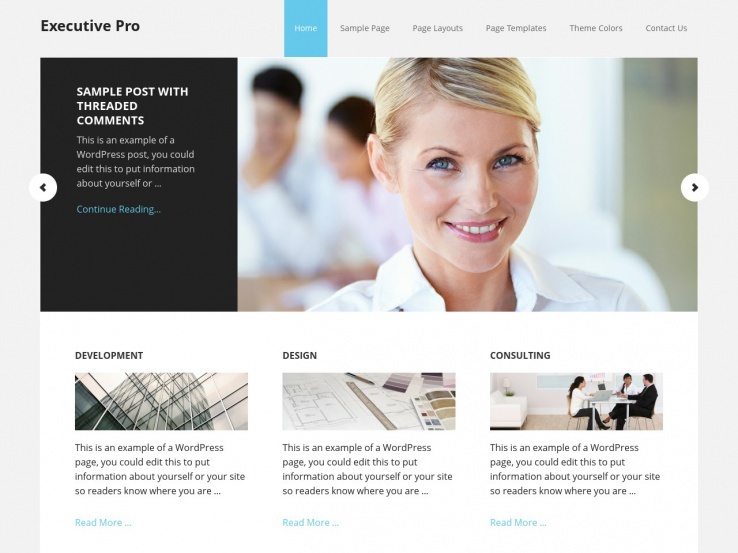 Renovate is a responsive and beautiful WordPress theme built by QuanticaLabs. QuanticaLabs is the same team that brought you the popular Fable theme for educational institutions, and MediCenter for doctors, hospitals, and others in the healthcare world. 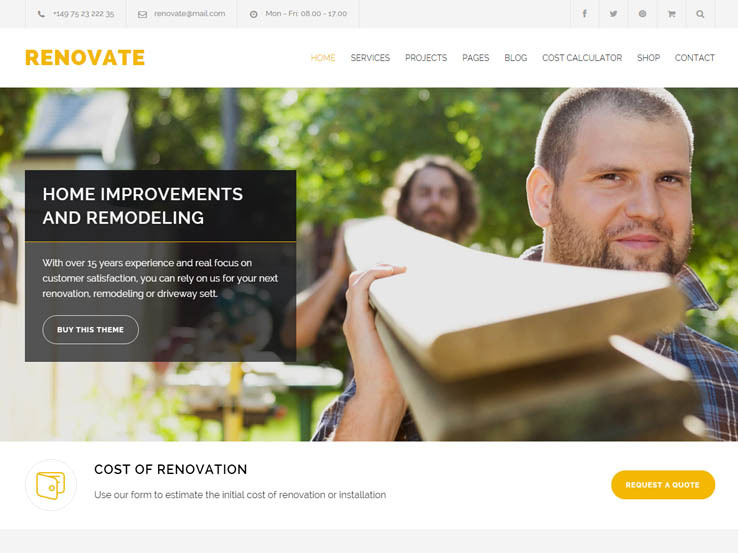 The Renovate theme is ideal for any application in the construction, building, architecture, or engineering fields. It offers all the feature richness you’ve come to expect from a premium WordPress theme, plus a design that’s sleek, professional, and clean. Additionally, the theme comes with a built-in cost calculator so you can offer your clients a way to generate rough estimates on the cost of remodels, additions, and repairs. The theme comes packaged with the premium Slider Revolution plugin, as well as the Visual Composer page builder plugin. It also offers a suite of customization options including premium font icons, 12 page templates, touch friendly sliders, AJAX contact forms, and sticky menus. 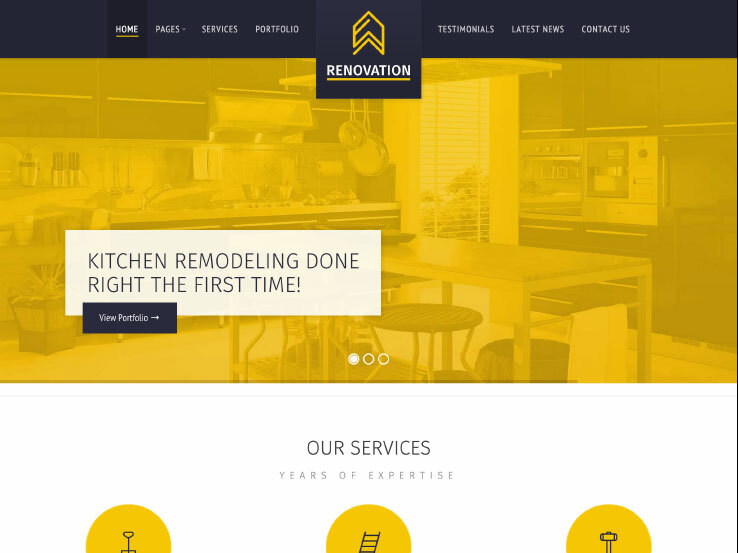 If you’re building a website for any construction related business, the Renovate theme should be on your list. The BuildPress theme offers a striking header area for you to reveal the most important contact information for your firm. 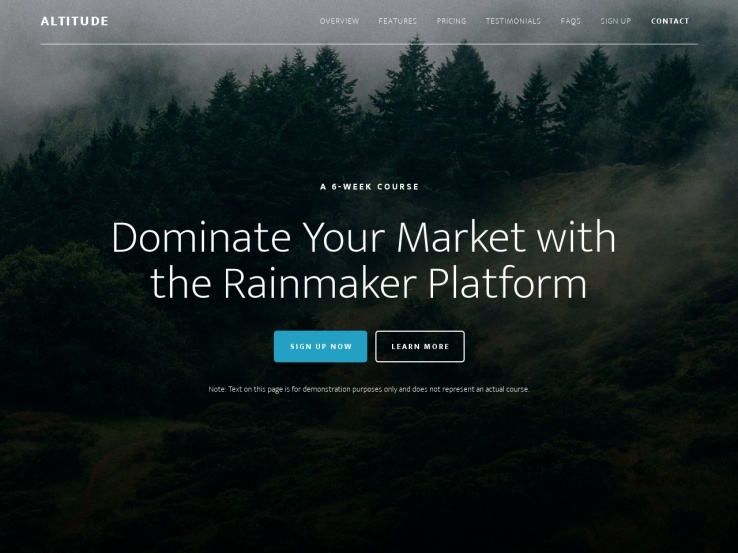 This is one of the best selling themes on the Envato Market, and that’s probably because it comes with a one-click demo installer so you don’t have to start from scratch. The intuitive page builder allows you to drag-and-drop page elements easily. Along with a responsive design and a real-time customizer, this theme is ideal for those with limited design knowledge. 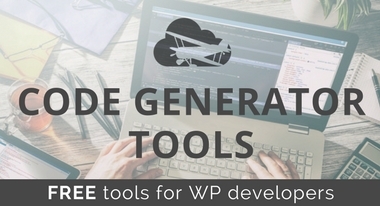 The sidebars and widgets are useful for construction companies who want to build social presence (with social media widgets and buttons) and the WooCommerce compatibility is nice if you’d like to sell certain items to your clients online. This is a theme that is built to last; we especially enjoy the clear contact information for acquiring more clients. 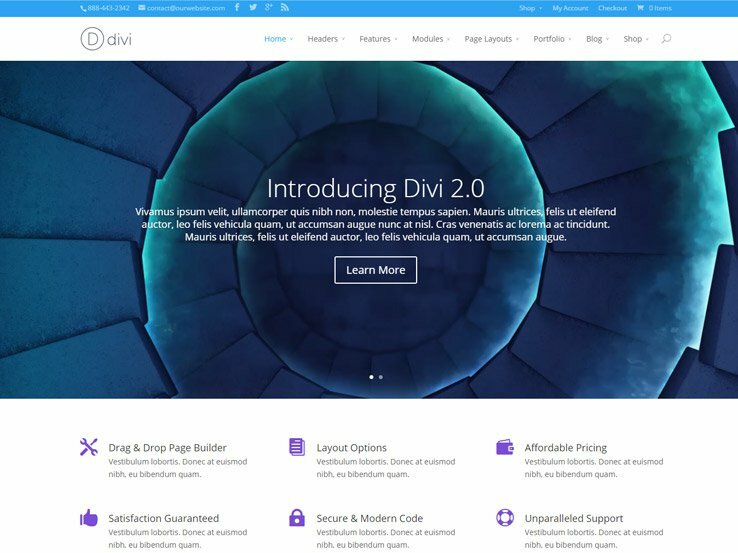 Divi is one of our favorite WordPress themes for just about any industry, and it works wonders for construction companies because of its revolutionary customization functionality. To start, it comes with the drag-and-drop Divi Builder so you don’t have to touch any code, and the 18 pre-made layouts ensure your site doesn’t look like any of your competitors. You also receive a secure and responsive layout so you know that your website is protected and usable on varying devices. 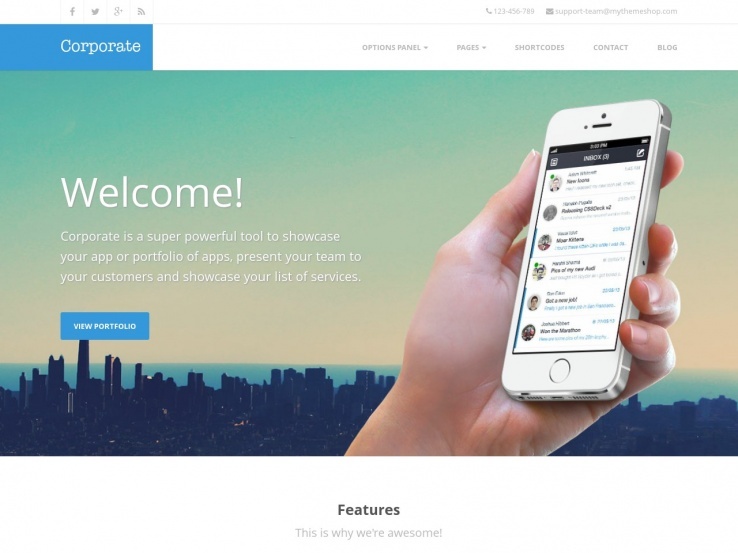 It truly is one of the smartest and most flexible themes for small and large businesses alike. The Divi Builder works well for construction companies since you probably don’t have much time to spend on web design. With this, you can drag elements like contact forms, full-width sliders, calls to action, and pricing tables. An added bonus is that the theme translates into 32 languages, catering to people in your community who may not speak the same language as you. 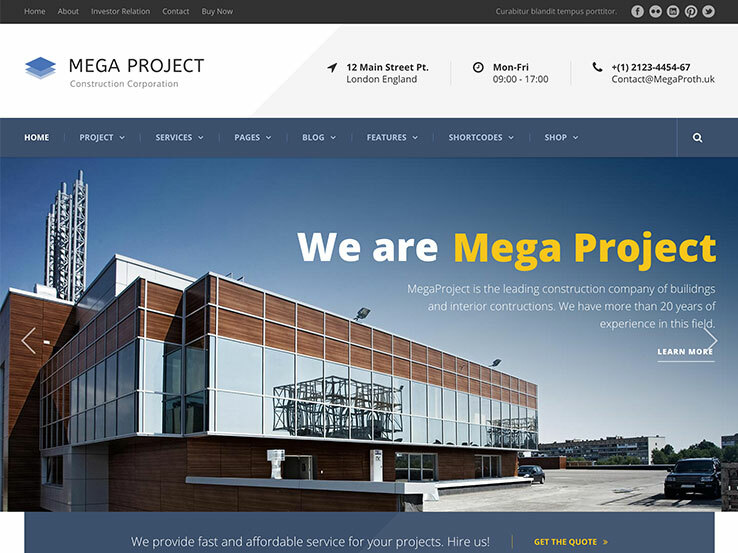 The Mega Project is designed for construction companies specifically, with a stunning slider for showcasing your best jobs. It also includes the Goodlayers page builder so you never have to touch any code when designing your pages. Choose between boxed and full-width layouts and integrate with WooCommerce if you plan on selling any items through your website. It also comes with multiple blog layouts, shortcodes, a project section with filters, and prominent contact info in the header section. All in all, this is a choice theme for construction professionals. The Construction name says it all for this theme since it’s a tailor-made theme for construction and design businesses. Include a video in your header or change things up to have a transparent header with overlaying text. The included free Essential Grid plugin is a unique way to move around your website components in a grid format with minimal fuss. 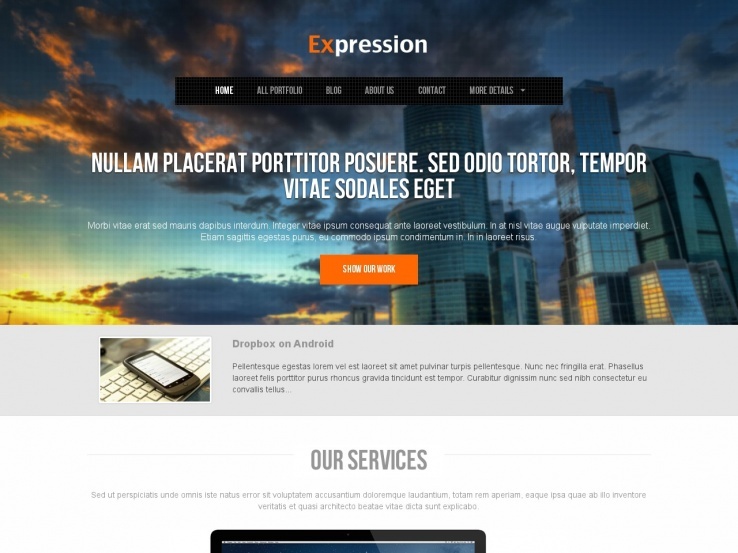 The fully responsive theme also comes with more than 600 Google Fonts to further brand your website. 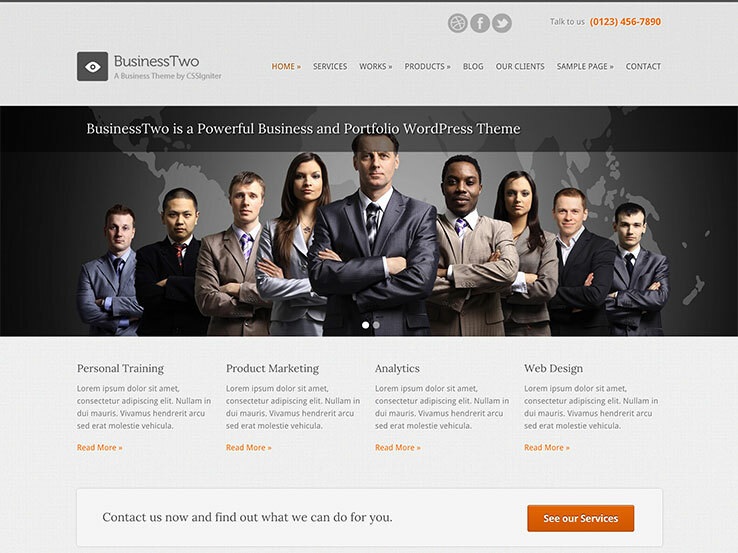 The BusinessTwo WordPress theme comes from the folks at CSSIgniter, and they never seem to disappoint, with a portfolio view for your past projects and an advanced showcase feature to display your work in varying formats. The theme comes with seven sidebars and multiple custom widgets. We particularly enjoy the shortcodes for generating columns, dividers, and buttons. 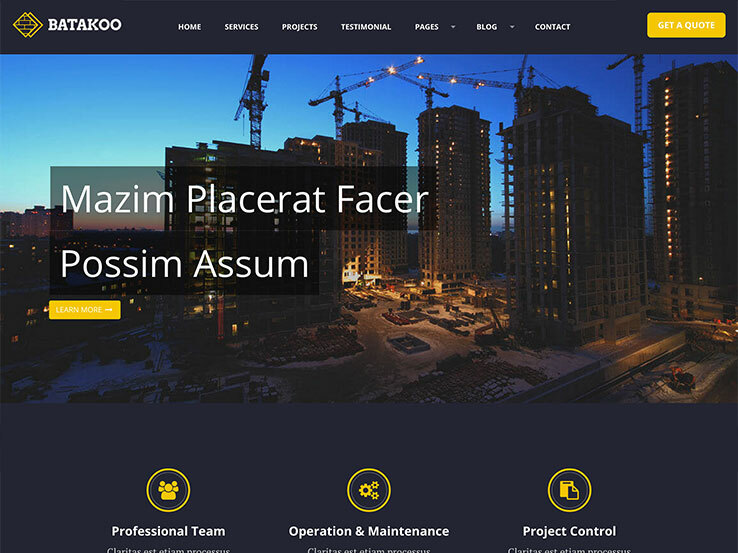 It also includes multiple page templates, a service call to action button, and social media integration, making this theme is a top choice for the construction industry. Apex Construction is a theme from Templatic, which separates posts and pages from “property” pages so you can keep your most important jobs organized. The main benefit of this theme is that the homepage is entirely widgetized, allowing for a drag-and-drop experience. This means that you don’t need any coding knowledge to design a website that looks professional and appealing. You also get an author widget for sharing blog posts and crediting the people who write the article. Post your contact details with ease, include a form to keep your emails secure, and display a full-width banner with a call to action for giveaways to bring more email subscribers onto your list. The testimonials module is also a favorite since testimonials are some of the best ways to bring in new construction clients. 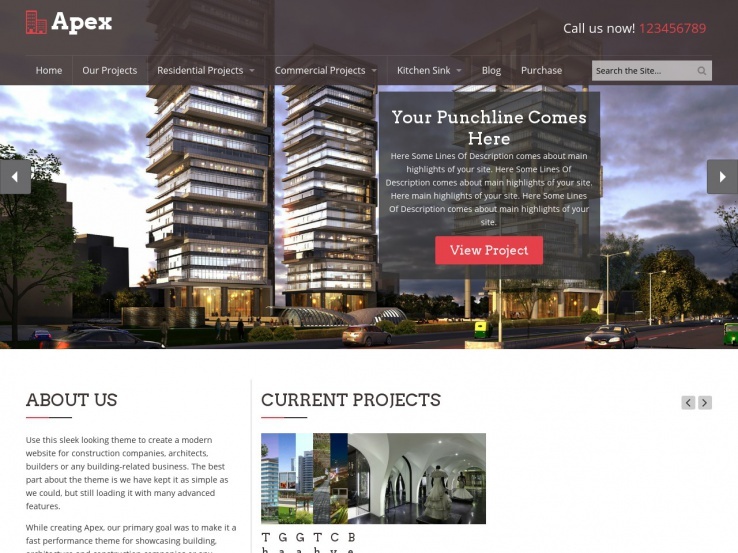 Along with striking social media buttons for connecting with people on Facebook and Twitter, and several other page formats (like a blog, category page, property page, and more) you really can’t go wrong with the Apex Construction theme. If you’re looking to convert visitors into clients, consider the Expression WordPress theme. The stunning, wide-screen layout grabs attention immediately. Plus, the entire theme is built to run on a single page, so your visitors don’t have to go digging for information it’s all presented up front. Create an area to introduce your team and promote your services on a neatly formatted service page. There’s a grid-style layout for displaying previous projects, a stylish testimonials section, and a contact form so potential clients can easily contact you. Parallax scrolling adds a nice touch to the completed look. 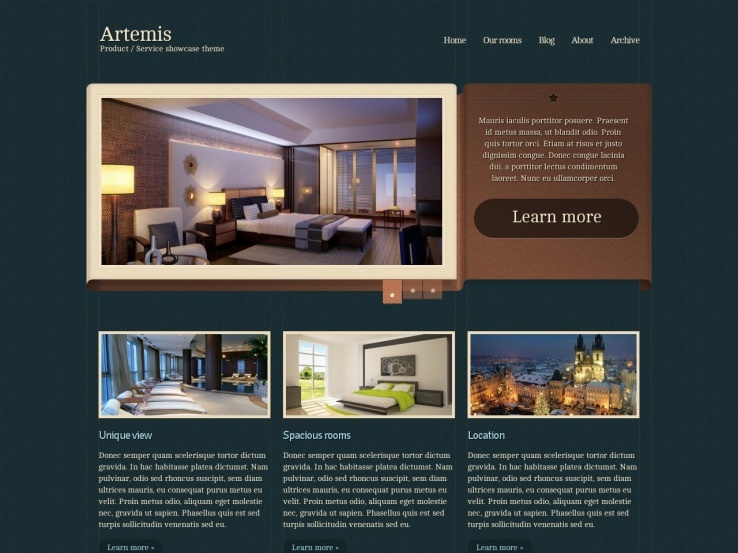 The Artemis theme features a homepage slider that comes with 10 effects to separate yourself from the competition. The custom widgets and featured boxes are the closest thing you can get to a drag-and-drop editor. Not to mention, the theme comes with a newsletter management module for building an email list and collecting these emails into something like MailChimp. What I like most about this theme is that it sports a classic look. Its timelessness will appeal to clients of all ages and demographics. While the demo appears to be designed for hotels, this theme could easily be adapted to an architect’s portfolio. 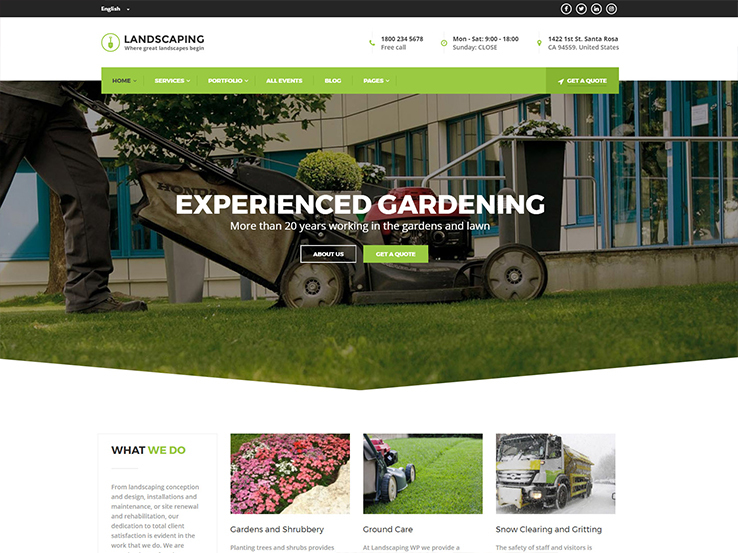 The landscaping WordPress theme offers a beautiful and trendy design for gardening and landscaping websites. The feature-rich theme comes with a projects gallery to showcase your work, 3 pre-built demo designs to choose from, eCommerce support, and a responsive and Retina-Ready design to ensure your site works correctly on all devices and screen sizes. The slider allows you to highlight your best content and draw in visitors with stunning transition effects and custom animations, while a services section lets you display what you do. In addition, you’ll find a drag-and-drop builder to easily create custom page layouts, unlimited colors and skins for branding, and a simple events management system. BusinessOne is another favorite from CSSIgniter. 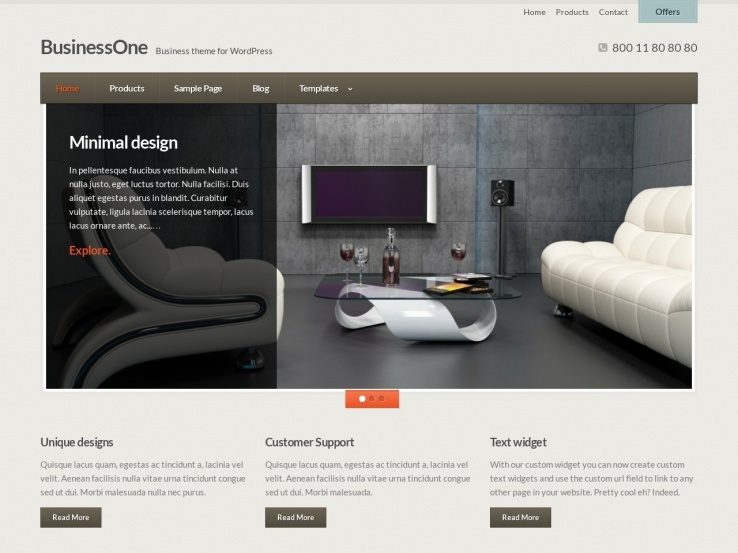 This theme comes with Gravity Forms for customizing how customers will contact you for new projects. The theme provides a sleek testimonials page, too. We also like the simple theme options area and the numerous shortcodes for making areas into columns and buttons. The Altitude Pro theme is a gem from StudioPress since it integrates with the Genesis Framework, which works wonders for customization. Some of the top businesses use the Genesis Framework, and this theme blends with it to create a parallax effect at the top of your website. The custom backgrounds and color options require little to no design knowledge, and it’s mobile responsive, ensuring your content is easily visible on mobile devices. 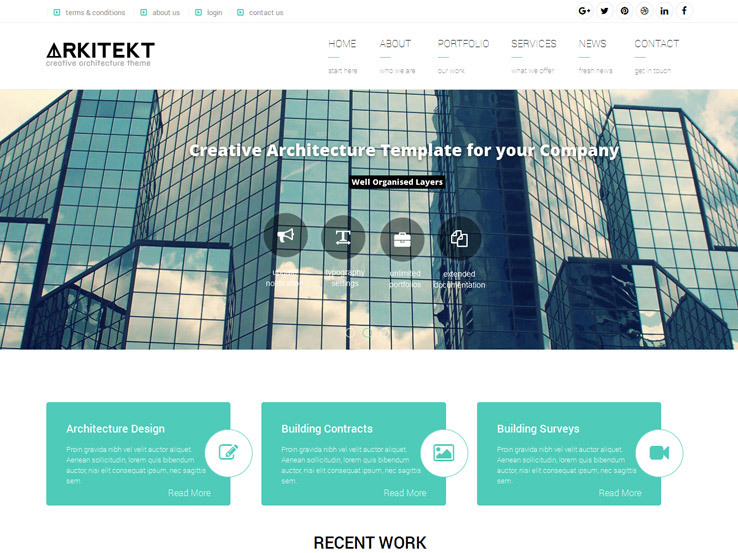 The Arkitekt theme is packed with premium plugins. To start, the Visual Composer plugin is the top drag-and-drop page builder on the market, and the Revolution Slider plugin generates a customization heaven for those who really want to make their sliders pop. The theme is SEO optimized for building your online exposure, and the multitude of free fonts and colors provide a simple way to brand your website without touching a line of code. 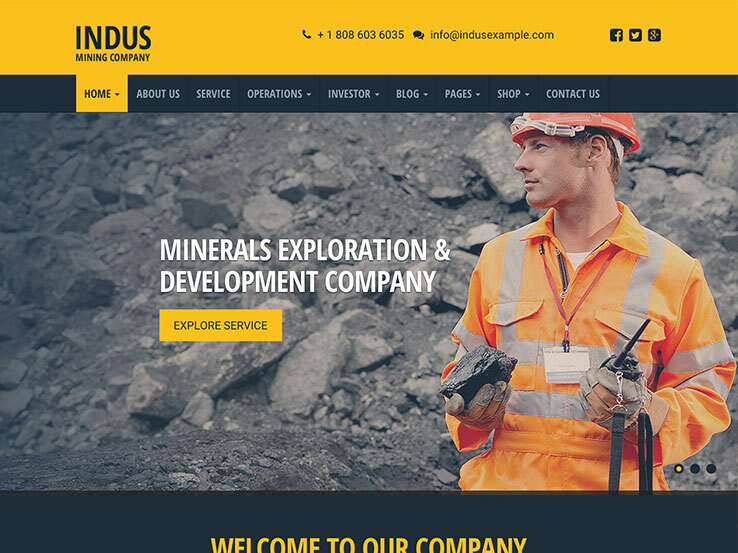 Right out of the box, INDUS looks like a theme that could work for just about any construction company. The bright yellow colors are customizable, and the demo content is ideal if you don’t want to start from a blank slate during the design process. The responsive design comes with the Visual Composer plugin so you can move around your modules instead of messing with code. With WooCommerce support and translation-ready design, you can’t go wrong with this one. If you crave a modern look, go for the Batakoo Modern Construction Theme. This sleek design provides a drag-and-drop page builder and a live customizer for real-time results while you change around your website. The theme comes prepackaged with the Slider Revolution plugin, and the typography options are expansive with over 600 Google Fonts. 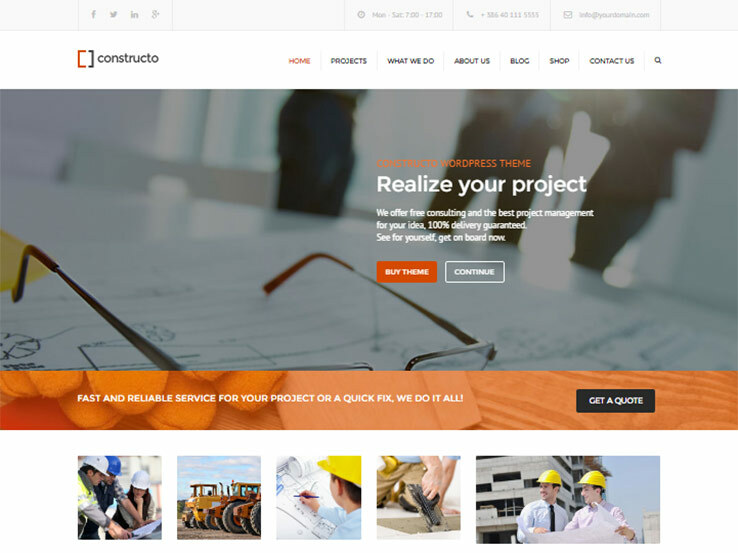 The Constructo theme boasts a design that’s clearly made for construction companies. This theme comes packaged with the Visual Composer plugin, so you never have to worry about code. Not to mention, the one-click demo install makes you feel like a professional designer from the start. Responsiveness is a must nowadays, so the theme comes with mobile responsiveness, and the unlimited sidebars and custom widgets will come in handy when it’s time to make simple customizations. 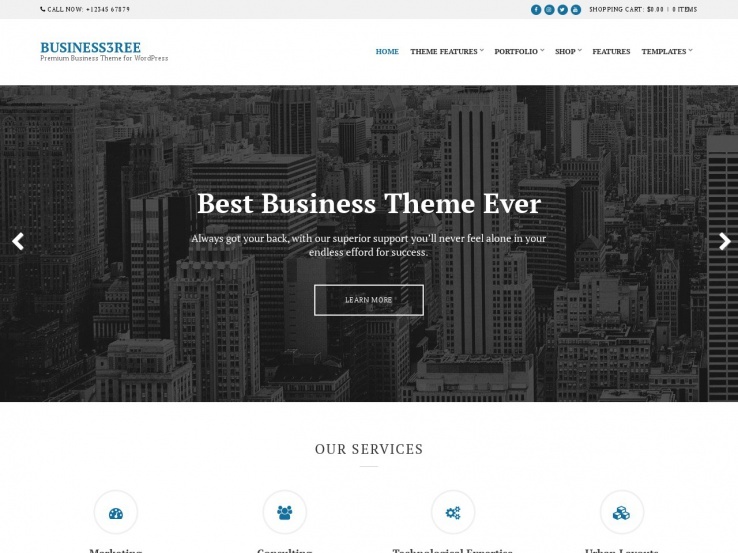 With a faded black and white header and a powerful portfolio designer, the Business3ree theme strikes a cord for those who visit. Drag and drop your components on the homepage, and play around with the seven custom post types. The custom widgets are a nice touch, and you can always include a WooCommerce store for selling items if needed. 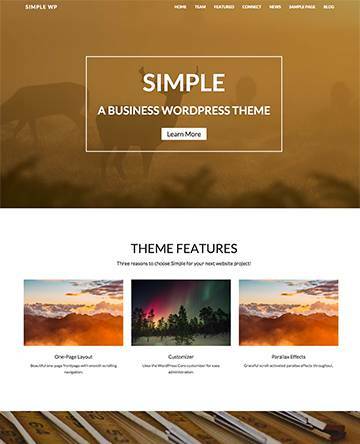 This is another theme from CSSIgniter that puts your content front and center and makes it a breeze to present your business to potential clients. Business3ree is stylish, customizable, and multi-purpose, making it a stellar choice for all businesses, not just those in the construction industry. Corporate by MTS is a wonderful theme if you are striving for something more professional. With a fluid responsive design and unlimited colors, you can always brand your website the way you want to. The theme is optimized for SEO and speed, so your clients will never get frustrated waiting for a page to load. This theme is clean and simple, but it’s definitely not boring. With prominent sections to highlight your team, services, past work, experience level, and pricing, you’re certain to capture the attention of potential clients. Corporate also allows you to add a subscription sign up form, testimonials, and fun stats to further engage visitors. 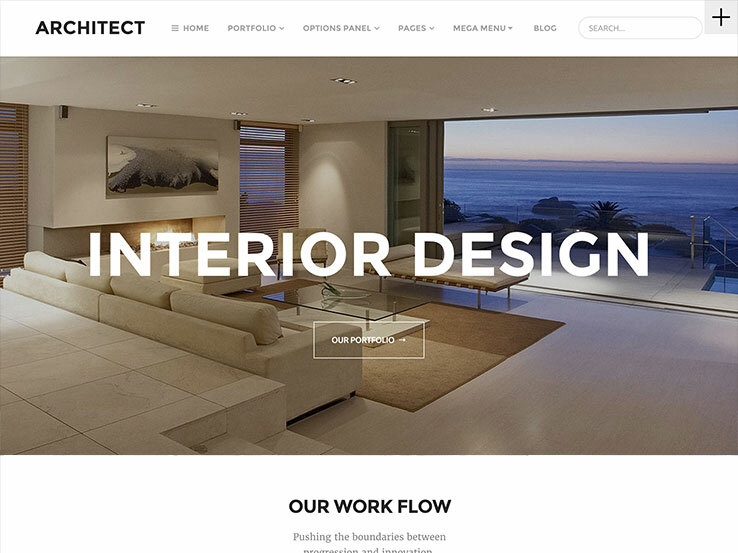 The Architect by MTS theme sticks to a white background, but you can always change out the header to reveal some of your most appealing projects. It includes a portfolio post type so you never have to wonder whether an item is a page or portfolio piece. The homepage is all drag and drop, and it even comes with a Google Maps area for showing your customers where to go to pay you a visit. Other features include a stunning mega menu, parallax scrolling, a full theme options panel, company facts or stats, a Twitter feed, a team section, testimonials, recent projects, and more. 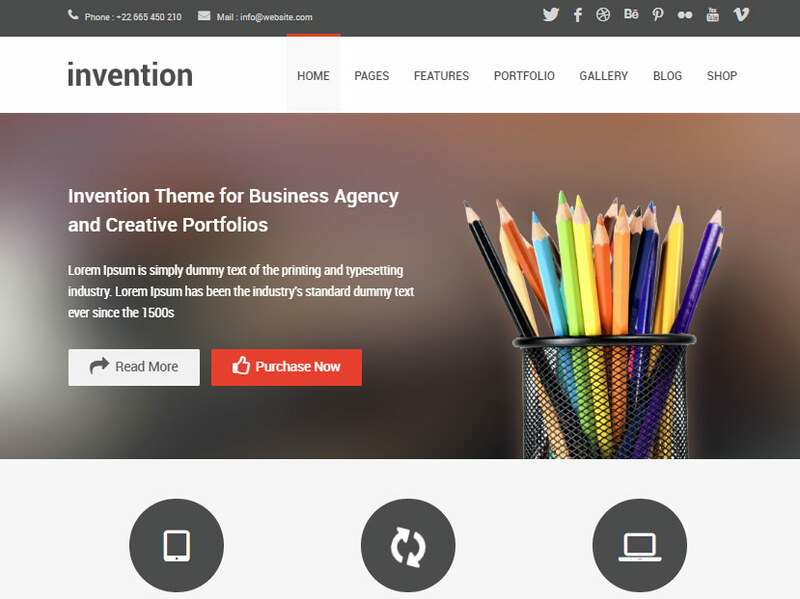 The Invention Responsive theme has the word “responsive” in the name, so you know it’s ideal for viewing on mobile devices. 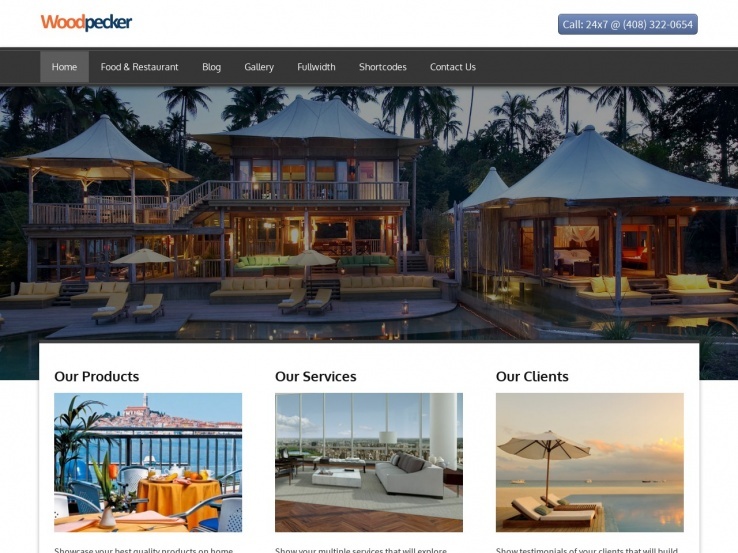 The theme includes a parallax header along with some solid flat designs to stand out from the crowd. Showcase your portfolio on the homepage and play around with the many shortcodes for customizing with buttons and columns. 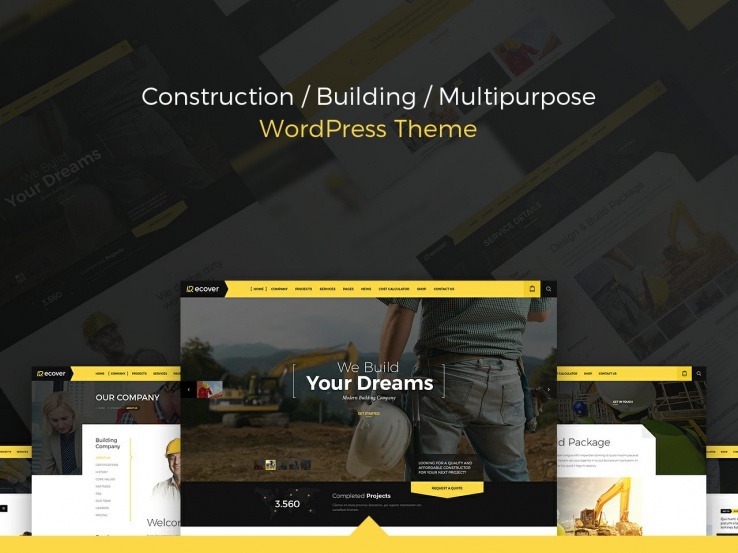 It’s a flexible theme perfect for any construction industry site. 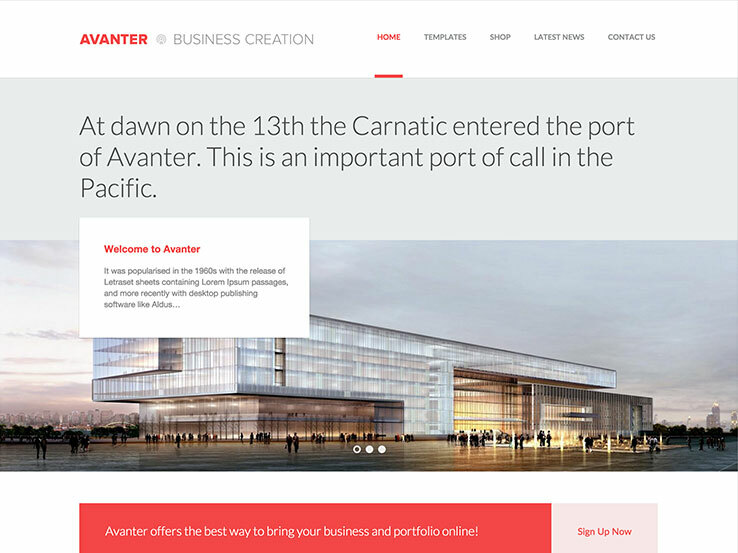 The Avanter theme features a somewhat minimalist design, with the ability to work as an eCommerce website as well. You can always customize the colors however you want, and the fully responsive theme is perfect if you need to translate your website for international clients. Video documentation comes with the theme so you never have to wait around for a support email if you have a problem. StudioPress is no slouch when it comes to pumping out some of the most stylish, functional themes on the market, and the Executive Pro Theme is no different. The seven color styles are perfect for keeping your brand unique, and the custom background works well for showcasing one of your favorite projects. 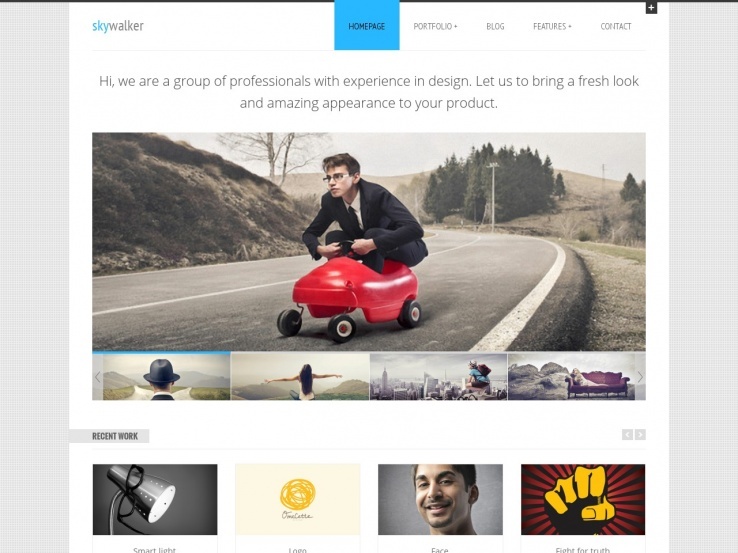 The theme comes with a powerful slider and it is designed to bring your most important projects front and center. SkyWalker has nothing to do with Star Wars, but the theme helps you grab attention just like the movies. The minimalist design works well for any business looking to share a stylish portfolio without all the clutter of the many other sites out there. We like the portfolio because visitors can filter through various categories to locate the options they desire. Along with built-in shortcodes and social media support, this theme works well for construction companies who want more exposure. 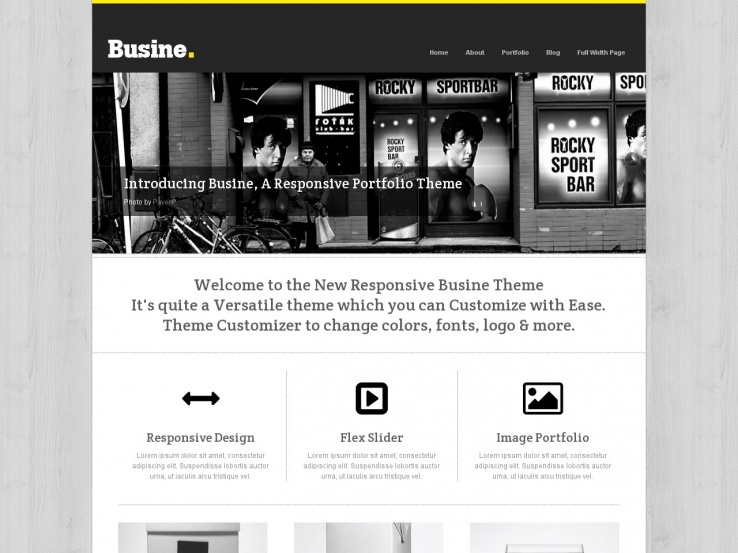 The Busine theme works to reveal your portfolio in the best way possible. With a theme customizer and a clean design for showing off your best work without all of the clutter, this theme is worth consideration. Hundreds of Google Fonts come along with the theme so you can brand the website however you like, too. 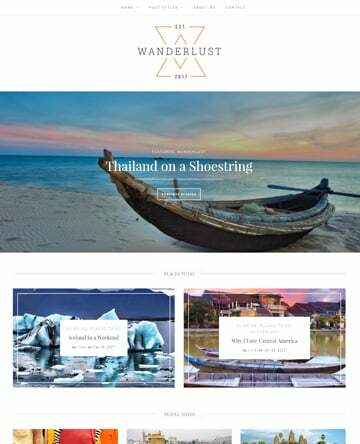 We really enjoy the custom widgets that come with this theme, making it easy to move around your page elements and build the website you want. The full documentation and superior support is also a nice way to ease your mind in case any questions should arise. 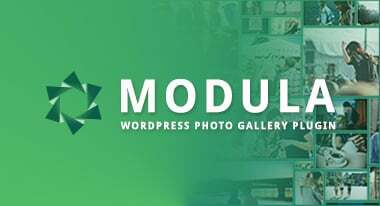 Serving as a general business theme, the Woodpecker option lets you reveal multiple high-resolution images in the full-width slider. Not to mention, the beautiful gallery is ideal for showing off your past jobs. Social icons integrate directly into your site, and the video box feature works surprisingly well with the theme’s responsive layout. An all-around good choice here. 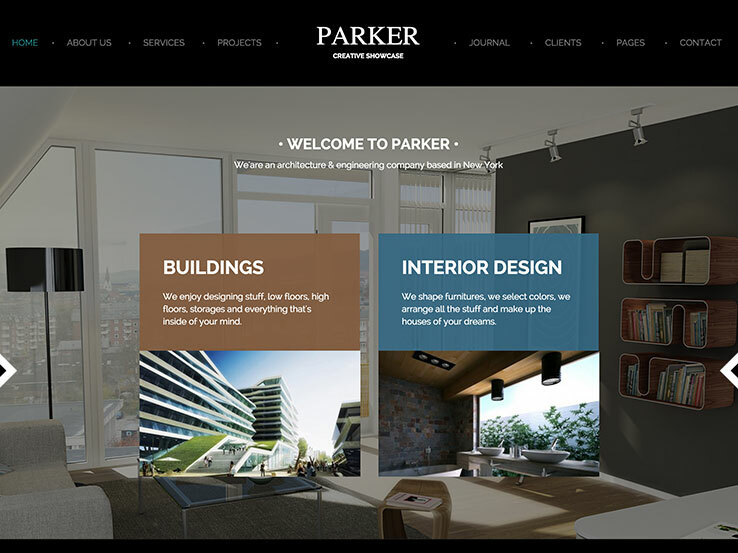 The Parker theme features a strong menu for showing people exactly where to go, and the four different homepages provide a way to differentiate yourself from other companies that choose the theme. Switch between light and dark skins depending on your brand, and choose between the 13 page templates while designing your website. Other features include hover effects, page transition effects, multiple blog post types, an accordion style service presentation, and more. The Renovation theme is one of our favorite themes because it has such a striking design, and it also comes with packaged demo content for those who want to start building with a little guidance right out of the box. You can quickly customize the colors on your website, and the responsive theme comes with the Revolution Slider plugin for making your project images pop. It’s also fairly easy to troubleshoot this theme since the support is wonderful and you receive all the PSD files and some video documentation upon download. 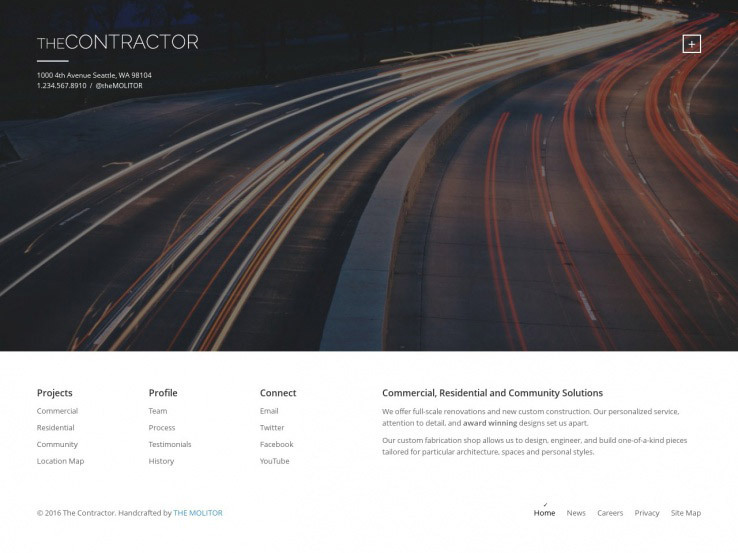 The Contractor WordPress theme offers a unique experience for construction companies since it immediately shares a wide header with faded imagery and text for contact information. The theme has a minimalist layout to bring readers’ eyes directly to what you want them to see. You’ll also notice a parallax effect if you scroll down toward the bottom of the page. The Contractor theme is completely responsive for viewing on phones and tablets when your clients are on the go. 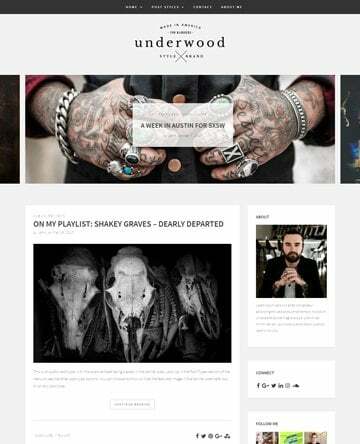 Unlimited color options mean that your branding process is easier, and the unique featured post area in the footer is ideal for pushing people to your past content. The best feature from this theme is an integrated map that displays the locations of all your current projects. Custom header support is included, along with slider options. Also, a parallax header effect is available if you’d like. All widgets blend nicely with the theme, whether you place them in your footer or sidebar. Infinite scrolling is a bonus, and the post-filtering is just another way to guide people through your website. Overall, this is one of the more basic looking construction themes you can find, but the features are extremely plentiful, allowing for lots of interaction to occur when clients come to your site. The goal is to make it as simple as possible for your clients, and this solution does the trick. For a design that scales well with smaller and larger images, the Arche theme works well. In fact, the theme is fully responsive for shaping your larger images into something that people can view on smaller screens. The 3D Layer Slider plugin is packaged for free so you won’t have any problems grabbing potential clients’ attention, and the unlimited color options provide the perfect opportunity for customization and branding. 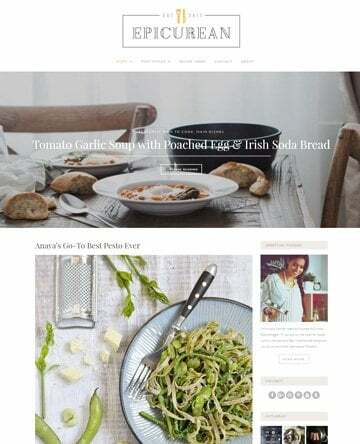 The Arche theme is all about showing potential clients that you can put your imagination to work, since it has multiple blog layouts for sharing your past jobs and talking about how you can improve work in the future. The multiple gallery layouts are ideal for organizing images of your work and making a portfolio layout. 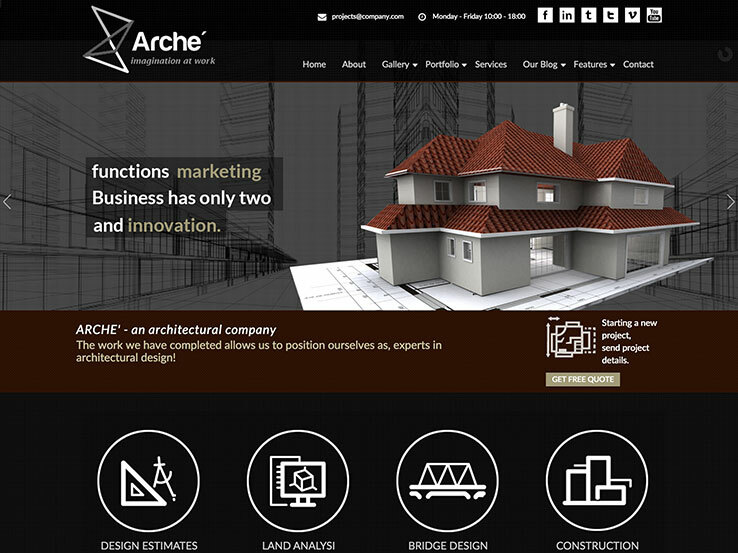 What’s more is that the Arche theme actually includes layouts for your portfolio; our favorite part of the Arche theme is that it comes with a drag-and-drop page builder, which works wonders for both beginners and advanced users since you can quickly drop modules wherever you want on the website without knowing much about coding. Multilingual support is offered, along with a drag-and-drop slider manager. Other features include a font uploader, background manager, Google Fonts, and shortcodes. Construction is built by the WPLook company. It works well for construction companies and architects, considering much of the demo content revolves around these types of images. The theme is extremely fast, and it has a responsive layout for people who are going to access your content on the go. The advanced theme options work well, and they combine nicely with the WooCommerce plugin, enabling you to sell items on your website. Choose from unlimited color schemes, and place social media sharing buttons all over your site. Seven custom post types and 12 widget areas are packaged into the Construction WordPress theme, creating a simple-to-use design environment for both advanced users and beginners. 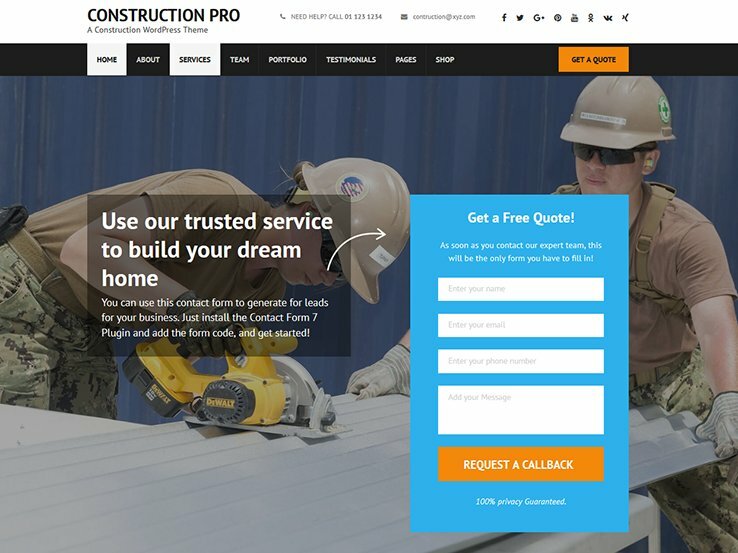 We enjoy the fact that it only takes a few minutes to install the Construction theme, and it posts your contact information at the top of the site. Even if someone opens up your site on a mobile phone, the user will immediately see how to call your company. The header slider has text and buttons for placing call to action copy. This improves your conversions and gives you a chance to show off some pictures from your past work. Services can be featured with visual icons, and testimonials are easy to implement, too. 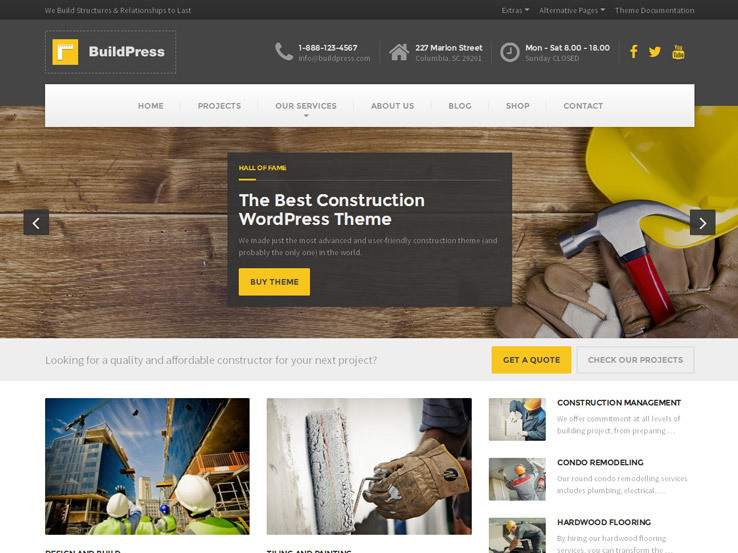 Along with tons of widgets for your footer, recent post modules, and various other tools, the Construction WordPress theme isn’t a bad choice for any contractor or architect. The Recover WordPress theme is useful for both construction and building website formats, using professional-looking elements to develop a beautiful layout for all businesses in this area. The fully responsive template works well for those who are going to come to your site on smaller devices. For example, one of your clients may want to check out your portfolio on a tablet. If this is the case, they’ll have no problem doing so. Quite a few website elements are packaged into the theme. For example, you receive access to over 300 theme options, all of which are easily manipulated on the live customizer. The over 53 visual page elements are moved around with the Visual Page Builder, a drag-and-drop editor with lots of great reviews. Over 90 header and footer options turn your website into something unique. Not to mention, two fantastic-looking skins are there for you to choose between a modern or classic style. The skins are modern and functional, with headers that present imagery and information about your construction business. Upload a photo of one of your job sites, and link to other pages that reveal more information. Talk about your services, and include buttons that lead users to a page that asks for a quote. Overall, the Recover WordPress theme delivers an impressive layout, so you can’t go wrong with this one. 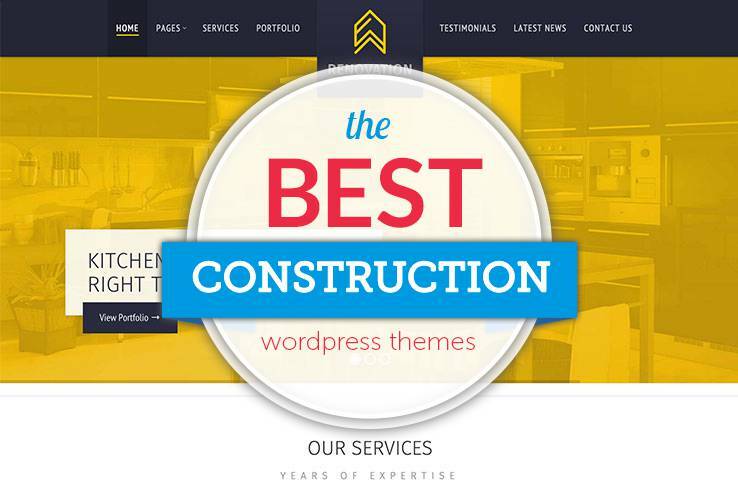 That’s it for the best construction WordPress themes. Share your thoughts in the comments section if you have any other suggestions. I think this Theme We Build is much better than all listed above. Its very flexible and easy to work with. Sorry but I found some of these themes downright basic. Here is a construction theme that means business. Hi Clare,\n Thanks for suggesting Constructioner to our readers. We appreciate it. 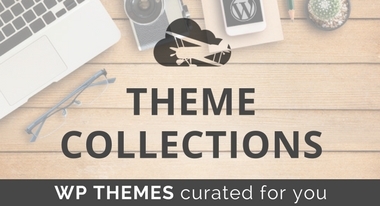 Awesome collection of Construction WordPress themes.This collection is very helpful for us. Thanks Katina for the feedback! We will be sure to keep updating this in the future. I don’t know why but I keep getting sent to list like these. I am not looking for WordPress themes for construction companies. I’m looking for a simple Custom Home Builders theme. One that allows you to post floorplans and also communities that you have. Like this link https://www.legacyhomesal.com …. If anyone can help me please do!!! Hi Herb, you might want to check out WP Floor plans plugin that enables you to display any plan. Does anyone else have a better suggestion? Amazing examples, thank you. We’ve got some really good ideas for some of our clients.